The initial rough cut of The Immigrant Garden first screened at Daryl Lund’s Historic Chehalis Movie Theater, Chehalis, WA, May 19, 2001. The film was digitally projected onto the theater’s 15 x 33 foot screen by use of a Sayno projector. American Production Services, an HDTV center located in Seattle, WA, provided the HDTV 1080i blow-up master from mini-dv master and a WVHS dupe of it was played back on a JVC HD analog VCR. A fundraiser for the Southwest Washington Ballet School, the screening raised $10,525 for the young dancers. 68% would give the home video as a gift. The Immigrant Garden started as a class project at Centralia Community College in 1999 and eventually grew into a full length feature film involving more than 300 inexperienced individuals living in rural Lewis, Cowlitz, and Thurston counties, WA. Shot in 42 days using a Canon XL1 mini-DV camera, the film was edited and posted on a PC using off the shelf consumer electronics such as Canopus capture cards, Antex digital sound cards, Creative Labs Audigy 5.1 cards, and ATI video cards. Software was also consumer based such as Adobe Illustration, Photoshop, and Premier as well as After Effects, Boris Effects, Alien Skin, Commotion, Vegas Video3, Sound Forge, and Syntrillium Cool Edit Pro software. Lights and Grip equipment were either homemade; such as our meenie weenie dolly, stedi-cam, and crane, or purchased off the shelf at a local hardware store. Lights were made from construction work lights, florescence shop lights, and simple light bulbs. Flags and nets came from welding rod, household door screens, sailcloth, muslin, black canvas, and used bed sheets. The screenplay would be written by a local writer and approved by the class. Lead actress would be a local. Supporting cast and crew would be local. Consumer level sound and video gear would be used. Grip and electrical products would be purchased and/or made locally. Art design and promo materials would be local. 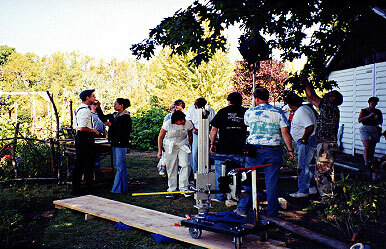 The entire cast and crew had never worked on a movie set before. This is the first digital film conceived, produced, and exhibited outside the Hollywood movie system The initial goal was to teach young people how to utilize emerging media technologies by making a three to five minute video. The Immigrant Garden was one of 30 scripts submitted that the students chose to produce instead of “more commercial fare”. I am not a gardener, and what I know about flowers is they grow from seeds in the ground, and come in assorted colors. But I know movies – at least pretend to – and “The Immigrant Garden” directed and produced by C. Tad Devlin, and scripted by Caroline Wood from her award-winning play, is going to need some tender cultivation to find an audience. Not that it is a bad movie. Being one of the fortunate few to have attended the world premier Saturday at the Chehalis Theater, I can say it is a competent, professionally made film. The story, set in 1910 Oakville, is about Cecily Barnes (Angela Johnson from Onalaska), and young woman turning 18 whose mother died when she was 3. She lives with her father, a teacher with propensity for bringing home cadet students for dinner – though with Cecily’s, shall we say, indelicate culinary ability, it is obvious the boys come to see Cecily, not to taste her cooking. Cecily finds a packet of seeds in a store one day and begins a correspondence with the seeds’ producer, Louise Beauchamp, an elderly woman living in England. The letters Cecily sends tell of her life, her thoughts, her feelings, while Louise’s convey wisdom, advice and encouragement. “The Immigrant Garden” is about time and place, growing pains, friendship, loss, family, and of course, gardens. 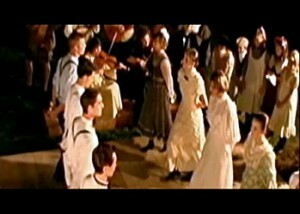 The appearance of the movie has a definite look of the early 20th century. The costumes and sets are perfect. The cinematography is good, with some quite beautiful shots, and the camera setups are generally well thought out. The music was great, as was the voice of Beverly Fite as Mrs. Beauchamp, reprising the role she played in New York. 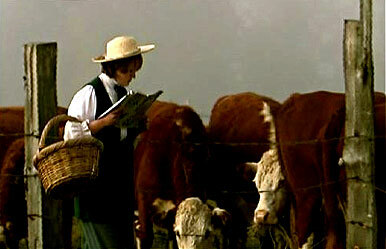 Her narration of Louise’s letters brings a class and dignity to the film. The majority of the cast is young, coming from Centralia, Kelso, Longveiw, Issaquah and points inbetween. It’s members did a fine job of capturing their characters with a minimum of effort. Curt Harris, as Cecily’s father, is also quite good as a man trying to be a dad when part of him died with his wife 14 years earlier. I mentioned this film will need careful cultivation to find it’s audience. It’s not the type of movie you see in your local Cineplex. It is not a Hollywood movie, which is probably good, because mediocre Hollywood movies are getting good reviews simply because they have risen to that smoggy rarefied air. “The Immigrant Garden” has the look and feel of a work you might see on PBS. But whatever the life of the film, we wish it well, and hope for more from Devlin in the future. The Blue Mouse will be hosting the Tacoma premiere of The Immigrant Garden. The movie will be shown on Saturday September 28 starting at noon, and 30 percent of the proceeds will go to the 2003 Proctor Arts Festival for the Proctor District Association. The Immigrant Garden is based on a play by Longview, WA., playwright Caroline Wood. It is produced and directed by C. Tad Devlin, a veteran of Hollywood and a producer on films including George of the Jungle and Sleeping with the Enemy. The movie offers a group of local actors and crewmembers. 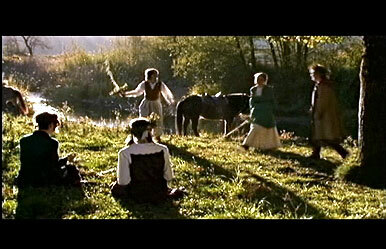 The film was shot in Washington and is set in Oakville, WA. in 1910. This is a lovely and lyrical film. The story of Cecily Barnes (Angela Johnson), a motherless teen, struggling to fill an empty hole inside herself. 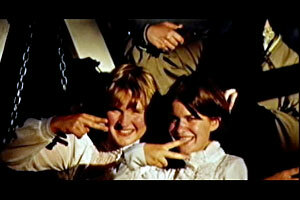 Her father (Curt Harris) is a teacher arid regularly trots his students home to indigestible dinners with Cecily. Her life, she says, seems happy from the outside, but inside Cecily is striving for something else. Then, one day, she stumbles upon a packet of hollyhock seeds at the local mercantile. 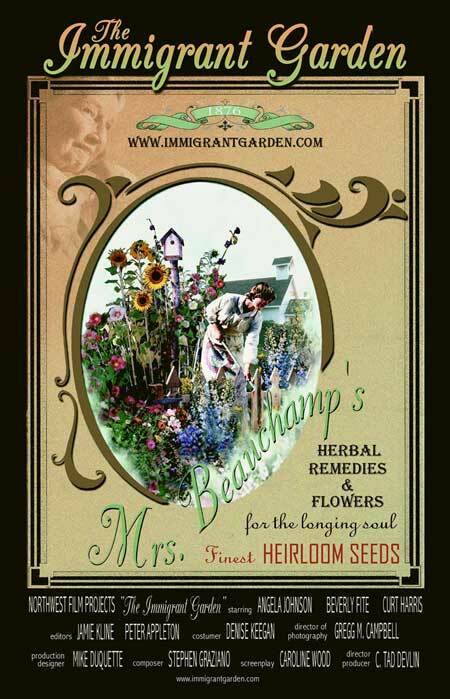 Even though the company no longer sells seeds, she takes a chance and writes to Mrs. Louise Beauchamp (Beverly Fife) and a friendship-as well as a garden blossom. The Immigrant Garden is full of wonderful characters brought to life by very competent, if unheard of, actors. Each shines in their role and brings a believability to the film. One of the remarkable things about this film is that, even though it is set in 1910, it is current and the events could just as easily be happening just down the Street. It is also that rarest of films. A non-rated film that adults will enjoy wholeheartedly. It is a film rather like Anne of Green Gables or The Secret Garden, gentle and sincere, and leaves the viewer with a sweet and gentle satisfaction when all is said and done. The Immigrant Garden will be showing at the Blue Mouse, 2611 N. Proctor St. (752.9500) at noon, 2:00 p.m., 4:oo p.m., 6:00 p.m. and 8:oo p.m. Ticket prices vary and are $8 and $10 in advance and $10 to $15 at the door. Tickets can be purchased at the Blue Mouse; Tacoma Trains, 2525 N. Proctor; Commodore Restaurant 3819 N. 26th; the Discovery Shop 2512 N. Proctor; Pacific Northwest Shop, 2702 N. Proctor and the Old House Mercantile 2717 N. Proctor. For information call The Blue Mouse at 752.9500.